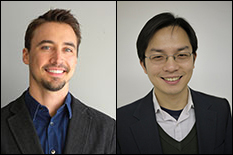 Two faculty members from the University of Maryland A. James Clark School of Engineering have received the Office of Naval Research (ONR) Young Investigator Award for their professional research projects. Liangbing Hu is an Assistant Professor in the Department of Materials Science and Engineering and the University of Maryland Energy Research Center (UMERC). The Young Investigator Award will support his research in Printable, Anisotropic Nanostructures with Boron Nitride Nanosheets for High Temperature Applications. Jeremy Munday is an Assistant Professor in the Department of Electrical and Computer Engineering, the Institute for Research in Electronics and Applied Physics (IREAP), and UMERC. The Young Investigator Award will support his research in Novel Optoelectronic Materials for Hot Carrier Effects. The ONR Young Investigator Program (YIP) seeks to identify and support scientists and engineers who show exceptional promise in creative research. The program’s objectives are to attract outstanding faculty members to support the ONR’s research areas, which cover a wide range of science and technology areas, from robotics to solar cells. The ONR has supported Young Investigators through this program for 31 years, making it one of the oldest scientific research advancement programs in the U.S. The program remains highly competitive, with 47 awardees out of 280 applicants this year. The candidates are all faculty who have obtained tenure-track positions within the past five years, and their proposals were selected based on past performance, technical merit, potential scientific breakthrough, and long-term university commitment. To learn more, read the ONR press release: Promising Basic Research: The 2016 ONR Young Investigators.